Today begins my personal Spring. Or so the voice in my head told me as I was out walking before sunrise this morning. And so I’ve resolved that today also begins my journey to the summer solstice. Each day I will rise before the sun, earlier and earlier to keep pace with its expanding arc as it journey’s towards its zenith, and take my walk in the glimmering, that quiet hour in which the dark has been pierced and the light is growing, but the world is still pristine, unsullied by the responsibilities of life and the world of commerce that clogs our streets and minds. Each day I shall watch the sunrise, to revel in the glory of the star that gives light and warmth and life to our planet, to behold the new beginning of each day, to celebrate the promise that new beginning holds, and if not celebrate – if my mood proves too gloomy – to at least honor that promise by bearing witness to the rising sun. It was actually the robins that drew me out of my home this morning. The building chorus outside my window called to me, irresistible sirens whose voices have so many times lured me into pleasurable sojourns. The invitation this morning was so reminiscent of a morning almost 30 years ago when I lived in north woods town of Bemidji. 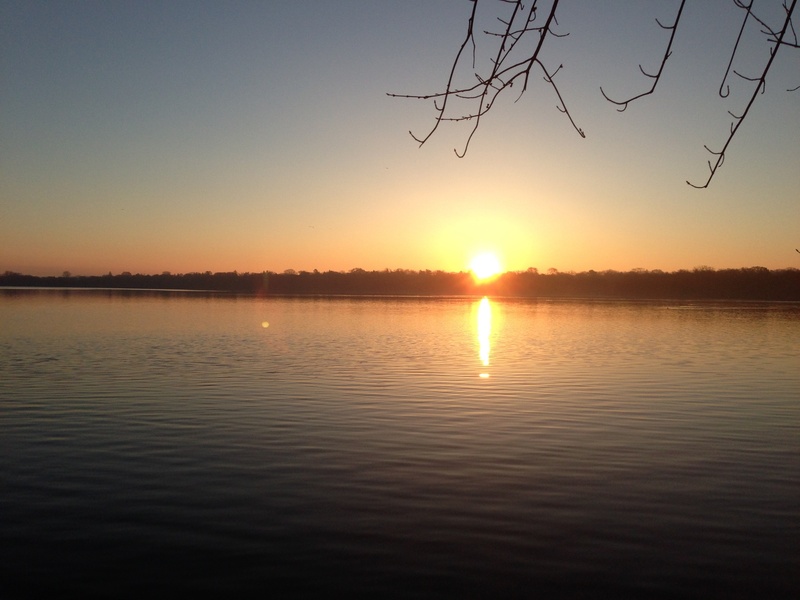 That morning too the robins called to me, and I enjoyed a walk of sublime peace through the empty streets that lead me to the shores of lake Bemidji. So today there was no thought of refusal as the robins coaxed me from my warm bed to venture into the chill spring air. 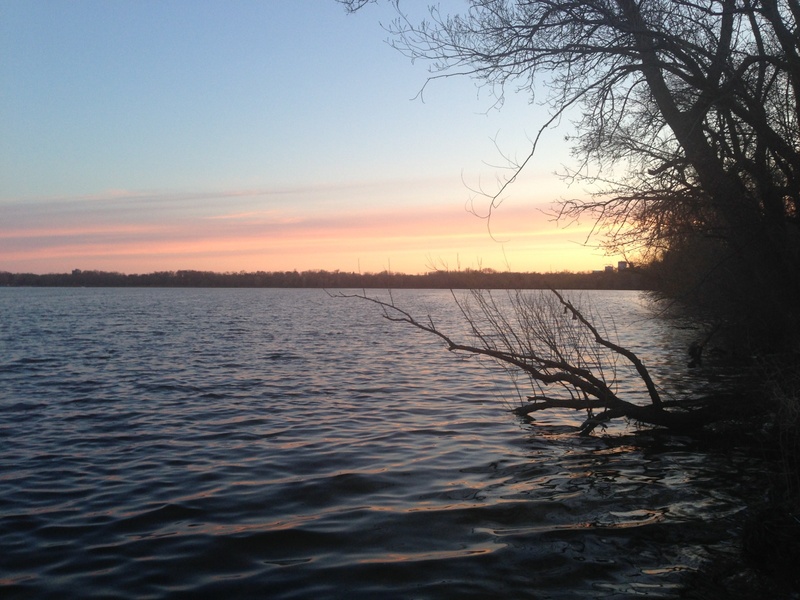 This walk, now in Minneapolis, led me to the shore of Lake Harriet. As I reached the far side I turned back to the east to discover the sun just beginning to creep over the horizon and climb through the trees that line the lake. A thin mist hovered above the frozen lake, it veiled the sun just enough so that the eye could look upon it without discomfort. Through this veil the sun rose like a pure incandescent sphere, as round as a marble. With its crisp edges and muted light, the sun could easily have been mistaken for the full moon, even its size was right. As it cleared the treetops, it hung there for a moment and a pileated woodpecker broke the silent morning air with its raucous cuck-cuck-cuck-cuck –cuck! For many years I have wanted create a ritual practice leading up to the summer solstice of rising at least 1 hour before sunrise, going for a walk, and watching the sun come up. Of course, this means that one must rise earlier and earlier as the days pass and the solstice approaches. 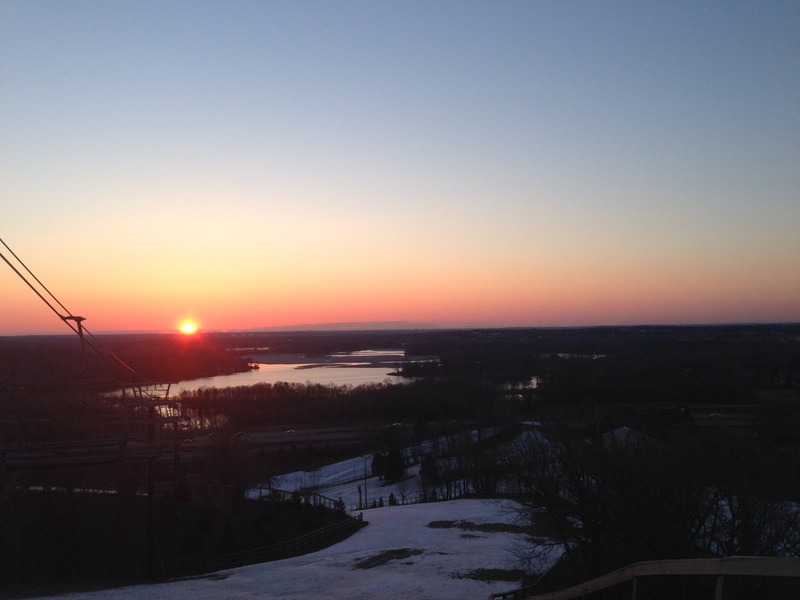 Where I live in Minneapolis, Minnesota, at the 45th parallel – exactly halfway between the equator and the north pole -the sun rises at 5:26 CDT on the solstice, which falls on June 21. This means rising at least by 4:26. I will have many early mornings! I am inspired to engage in this practice by the desire fully immerse myself into the seasonal change, to really experience the longer and longer days, to enjoy the dawn, to fill my lungs with fresh morning air and hopefully to fill my head with fresh morning thoughts, and to witness the daily miracle of rising sun. Added to this long held desire to engage in this ritual, a soulfriend introduced me to the practice of a yoga sadhana, which is a commitment to a daily spiritual discipline intended for self-improvement or self-transformation. There is something about the incremental pace of the changing season that I find deeply appealing, rising those few minutes earlier each day as the sun rises just a few moments earlier. But amassing over time, great change takes place. Perhaps part of my hope is that I will undergo an incremental change as well. The sun is my guiding light in this process. A shorter walk this morning, but lovely nonetheless. Air still crisp from the cold of this dawdling winter, the chorus of robins imprinting joyous pathways in the brain. A stroll through the neighborhood. Once again, like my walks through the Bemidji 30 years ago, I find the sidewalks too confining, too one-sided. So I walk down the center of the streets, enjoy the more expansive view, and feel more centered in the middle of the road, on the middle path. Just as yesterday, my main companions, besides the signing birds, are the rabbits. Near the end of my walk today a white rabbit appears out of nowhere -as if one of the clumps of snow that still lie upon the streets suddenly became animated – it darts across the street in front of me and disappears into someone’s back yard. Drat, no trespassing . I cannot follow the white rabbit like Alice or Neo. Perhaps I’ll give pursuit later, in a meditation. The moment the rabbit is gone, deep-throated wind chimes begin to peal, their long sonorous notes linger into one another, creating spontaneous chords, one set of melded notes bleeding into next. Without tune, melody, or rhythm, but only theme and variations, the morning breeze is a composer of the highest order, writing classical music that resonates the soul. An overcast morning, but as devoid of gloom as a morning can be. The resounding joy of the robins will not be denied. My walk is one of following my own footsteps, letting them they take me where they will, taking in what new sights they lead me to. Having just moved into the neighborhood, there are many streets to explore, many lovely homes to admire. What most catches my eye this morning are those front yards that have been landscaped for gardening. People’s imaginations have been at work, creating beautiful structures and spaces to enable them the pleasure of growing their own food. A band of open sky, as wide as the diameter of the sun, streaks through the clouds in the east. Within that narrow stage the sun enters, enacts its stately performance, fills the space floor to rafters, and then slips into oblivion. 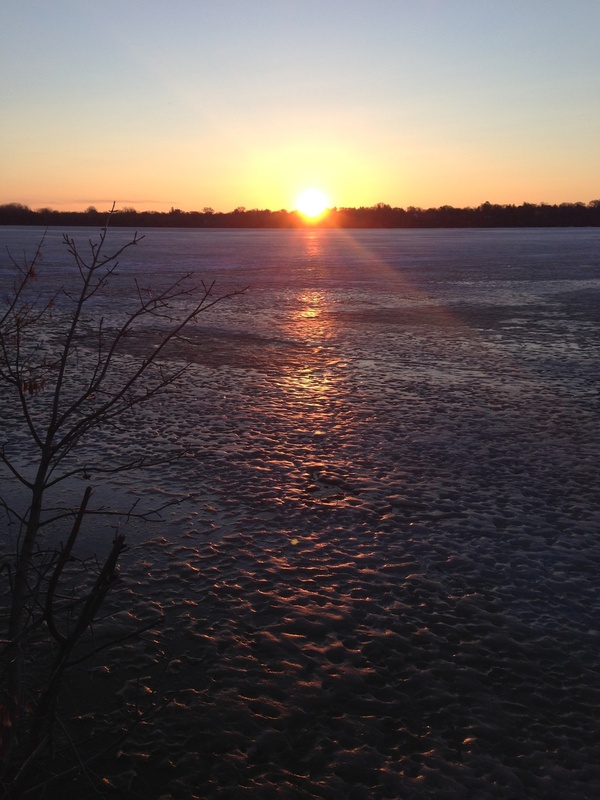 On day #4 of my Sunrise Sadhana, I was gifted with many mementos, including this beautiful sunrise over frozen, but thawing, Lake Harriet. Remarkably, just as on the first day of my Sadhana, just as the sun cleared the trees, a Pileated Woodpecker called again. I am very intrigued to discover if he continues his morning ritual with me! I was also gifted with the musical call of Tundra Swans as they flew overhead, so close they were I could hear the rushing of their wings, like a stream cascading over rocks. Here in central Minnesota, Trumpeter Swans are year-round residents, but in the spring Tundra Swans migrate through on their way back to their nesting grounds in the high Arctic. From a distance the calls of a flock of Tundra Swans have been mistaken for the sound of a pack of baying hounds. I first heard this as a young boy, and made that very mistake, while working on the farm where I grew up. Though it was in the fall of the year as the swans were migrating south. Here is a poem I wrote about 20 years about my experience as a boy. Lie scatter on the soggy ground. Fearing an attack of hounds. With my shovel in my hands. Rose very early. Walked around the lake in the dark. Heard the call of an owl that I have only heard in the woods before, never within a city – that of the Barred Owl. It’s unearthly, ghostly voice imploring “Who cooks…who cooks…who cooks for yoo-ooo-uuu-uuu?” was quite haunting. This coupled with the alarm notes of Wood Ducks “ooo-eeeek, ooo-eeeek, ooo-eeeek” as they flew off the lake made for an eerie moment. One other sound of note…Mallards have gathered at the small inlet to Lake Harriet, the ducks with the quintessential quack. It was another overcast morning, but as I was cresting the hill upon my return to my home, breaking clouds in the east created the most beautiful composition of fuchsia and lavender as the sunlight crept into them. Gorgeous. Inspiring. Woke up at 3:00 this morning. Couldn’t sleep. A painting, done by a soul friend, inspired me to write this poem. mementos, both loved and loathed. in the funeral pyre of its own memories. All is reduced to ashes, Bird and nest. like hot dust from whirling spindle and socket. From that glowing ember, a new incarnation is born. And begins a new cycle. As gratifying as it was to write the poem in the dark of the morning, as I later walked the streets to the lake, all I was conscious of was the taste ashes in my mouth. Clear sky overhead, but a cloud bank in the east hid the rising sun. I was not present with the morning. If it were possible, the resounding chorus of robins was today even louder than it has been before. I found myself to be at great peace as I walked in slow, measured steps, participating in the pageant of the morning. Such bliss the song birds bring, even under overcast skies. And perhaps I was still resonating from the meditation group the night before. Such a contrast to the morning before, present and not present, being and non-being. 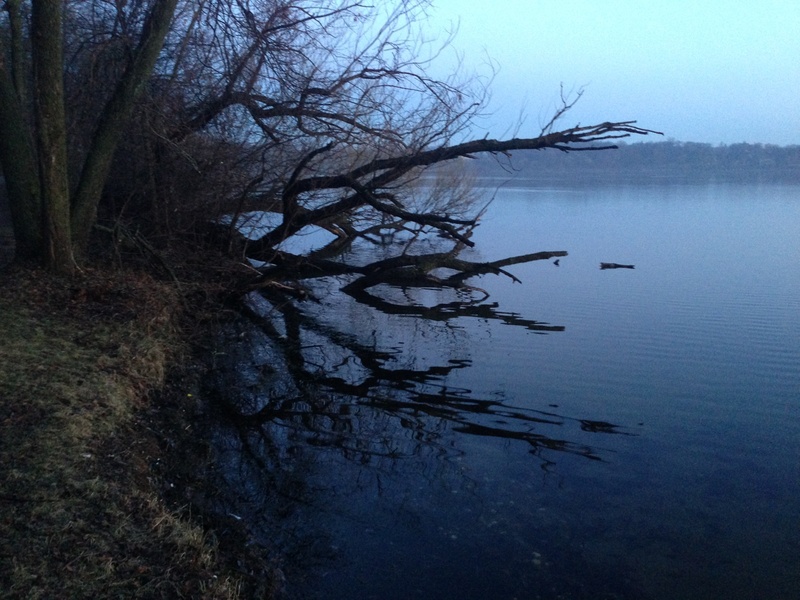 I reach the edge of the lake, hear something large climbing a tree. There is a good sized raccoon making its way up a very large Cottonwood Tree. The raccoon’s claws rake against the deeply furrowed bark of the Cottonwood as it climbs. It climbs high into the upper limbs and disappears, presumably into its den. To the north of the lake is an arboretum and garden, to the east of that is squat hill with flattened top about 100 feet in diameter. I climb the hill and look to the east. The sunrise is canceled today due to cloud cover. I do a slow, walking mediation, making circuits around the flat hilltop. Then, finding a station near the middle, I remove jacket and gloves and do several minutes of Qi Gong in the brisk April air. The plaintive “Pheeebeeee” calls of the chickadees seem to come from all sides of me. Plus a few Cardinals thrown in, alternating between bold and bubbly calls, and the twittering of some Juncos – birds in surround sound as I move the energy. The perfect soundtrack. 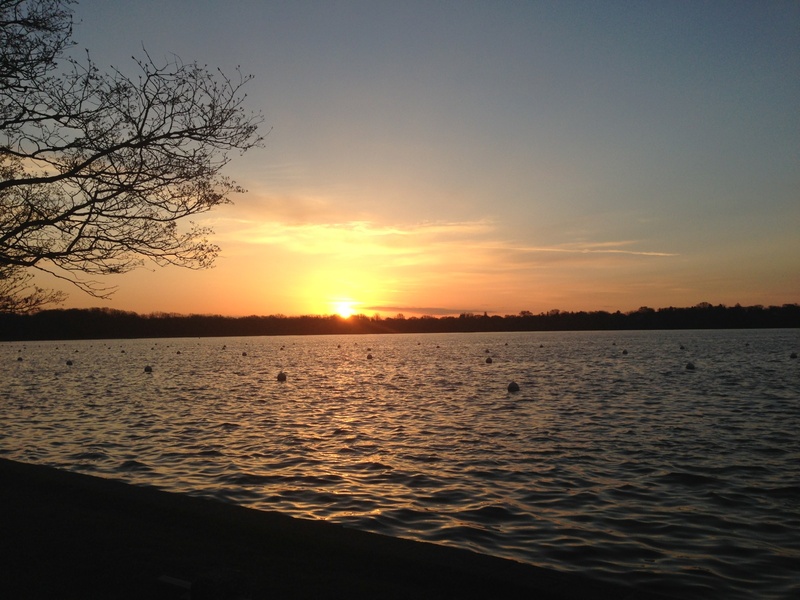 As spring migrates into summer, this will be a beautiful spot to do Qi Gong, facing the east as the sun rises. I feel a gentle anticipation about this. As the mornings warm, I envision standing barefoot on the grass, cultivating the energy of earth and sun. This could lead to a splendid melding of walk, moving meditation, and observance of the sunrise. 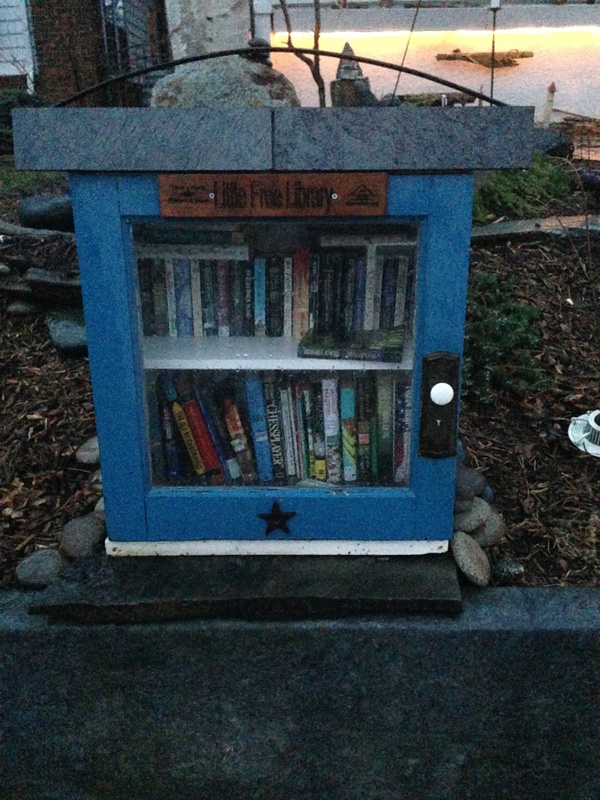 I take a different street home and discover two things. 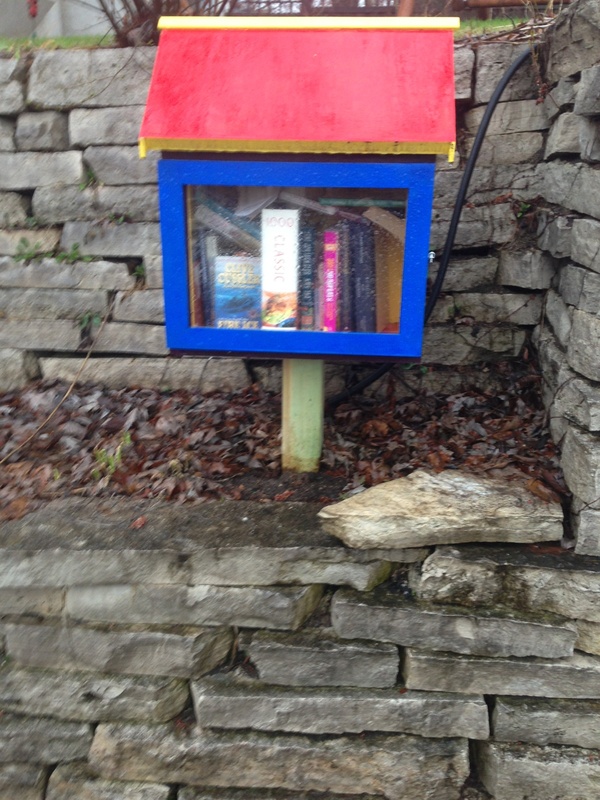 First, one of the houses I pass by has a casement on a stand filled with books. 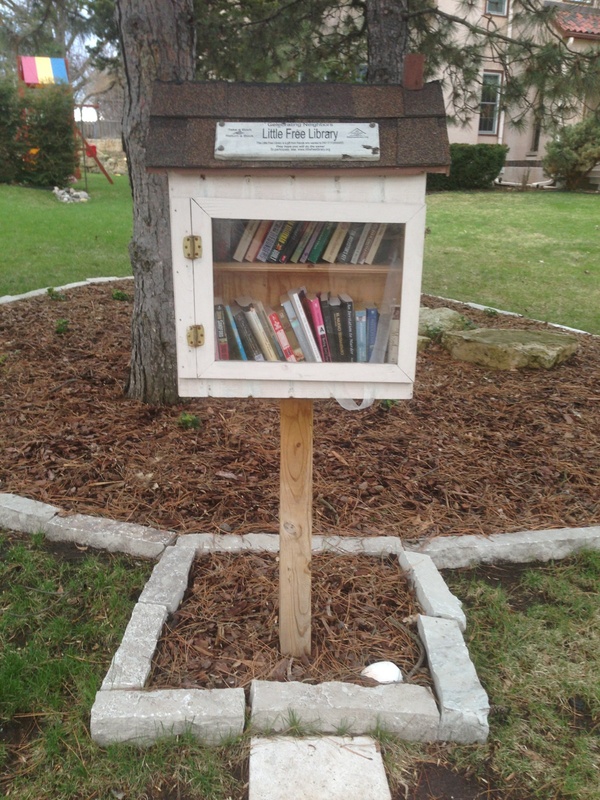 They are participating in the “Little Library System.” I love this concept. 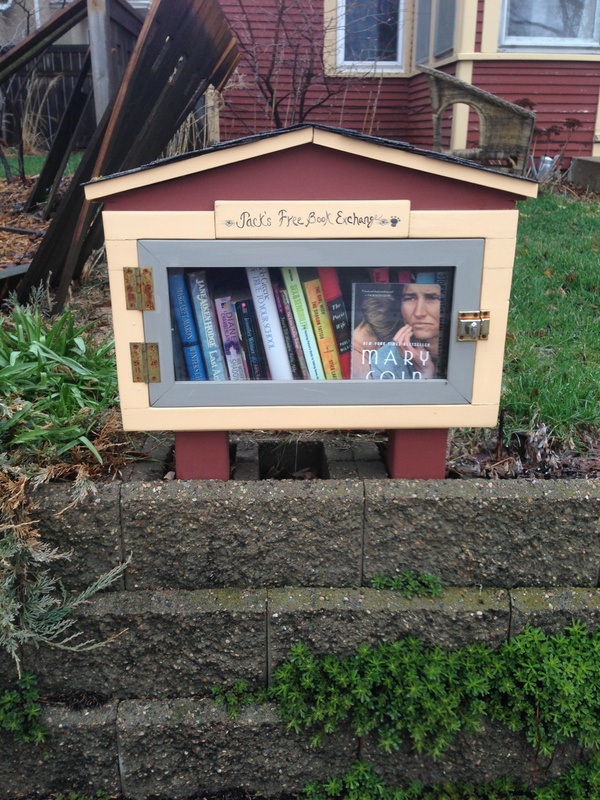 Miniature libraries on peoples yards from which others are welcome to take a book or to leave a book. No titles capture my fancy, until I see “The Strength Finder”, a book I read years ago, that helps one identify one’s core strengths out of 34 possibilities. Perhaps I need to revisit this. Second, I discover a coffee shop right on the way home. So, I have a delicious breakfast croissant and a decent cup of coffee and begin to read my book. Awaken at 3:00 am again. No poems to write this morning. Most days I awaken before the pain, but today the empty, hollow feeling is already with me. The forecast is for rain at 6:00 am, so I go out at 5:00 am to begin my walk. But the rain was anxious to greet me and so arrives early. It is a gentle, sleepy rain, not quite awake enough to fall with purpose, and so it drifts in and out of conversation with me. 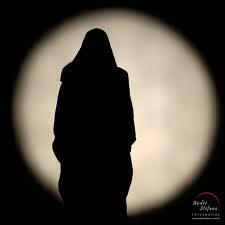 Shrouded with hood, I walk with head bowed, like a medieval penitent in rain gear, contemplating my footsteps, my heartbeats, and the syncopated tapping upon my head. Add to this my unregulated breath and countless other subcutaneous rhythms, what aggregated morse code am I tapping out to the universe? What message is the rain tapping into me? Who was I once? Who am I now? Who can I yet become? As in my poem on walking the labyrinth, I have journeyed far from my center, far from the source, and have all but lost the way back, all portals and stargates are experiencing intermittent technical difficulties. So looking at my intent for this daily practice and sadhana, there is the desire simply to experience the manifold beauties of the morning, there is the desire to encounter Spirit and to elevate my spirits, and there is the desire to become something more, something richer, something deeper, something truer, something nobler than I am now. The first step on that path is simply the discipline of doing something daily, of having an intent and sticking to it. That in itself could be transformative for someone such as myself that functions on whim and enthusiasm, or external compulsion. Second step, being present with both world and my intent. Third step, to connect with Spirit through that presence. Fourth step, to reflect upon my external and internal experience, to get the message, to be conscious of it, to become porous enough to allow insight to infiltrate my thoughts. These four steps, perhaps that is all I need to take on my walks each morning. Just keep taking these four steps, and let the path unfold. of raindrops upon my crown. am I tapping out to the universe? Stay clear – under quarantine? What message do I wish to emanate? Practiced my “four step” approach I mused about yesterday. It did prove to be an effective method for keeping engaged in the intent and not just walking and getting lost in my thoughts. Presence is a good thing. I added a fifth element, that so melds with the others it is really a natural fit. Adding the dimension of making each, or most, of my morning excursions a “Medicine Walk”. This is a Native American spiritual exercise, very simply put, one enters into nature with a specific question in mind and, preceding with presence, one pays attention to everything that one encounters. Then, when something strikes one with special import, something that stands out in high relief amongst all the other countless sights and sounds, this is the element that holds the answer to one’s question. Sometimes the insight is immediate, sometimes it must be lingered over, reflected upon, before the realization dawns. In answer to the question I posed this morning…. When reaching the lake, I have four options, I could walk the paths around it, I could walk to the hilltop to the northeast, I could walk throughout the small, landscaped arboretum and gardens, or I could walk into the natural marsh and woodland area. I had not taken this last route yet this spring, because of the snow and meltwater. But today it was sufficiently dry to travel at least part way into it. What I was soon struck with was the chorus of Redwing Black birds that filled the air. Here in the marsh they predominate, whereas the Robins are the chief singers in the “parkland” of the city yards. Two different ecosystems. Pondering that, the thought of Swan Lake came to mind, a 10,000 acre marshland that was 5 miles from the farm where I grew up. In that restored ecosystem, rich in its diversity, birds of great variety that have evolved for the marshland ecosystem flourish there. These birds could not live in a woodland. And most woodland birds would not do well living in the marsh. Two different ecosystems. Two different worlds. The inhabitants of one, evolved to function in that environment, cannot flourish in another where its needs are not met. They must be fed by the foods found in their environment, they must be sheltered by the materials found in their environment, they rely upon the interconnections with all the other inhabitants of their niche, and they fulfill their unique role within that environment. Everything eventually intertwines into the same web of life, but there are separate realms within that web that function very differently from other realms. Redwings and robins flourish in two different realms. A person must live and love in the realm in which they can flourish, in one that their personal evolution has prepared them for. Overcast, cold, and windy. Temp is 28, wind chill is 16. No chorus of robins singing to day; but there are a few lusty suiters scattered here and there, whose voices seem more robust than usual. Only the most hale & hearty are out on a morning like this, committed to their cause. One hopes their resolve is rewarded and their ardent desires are fulfilled. 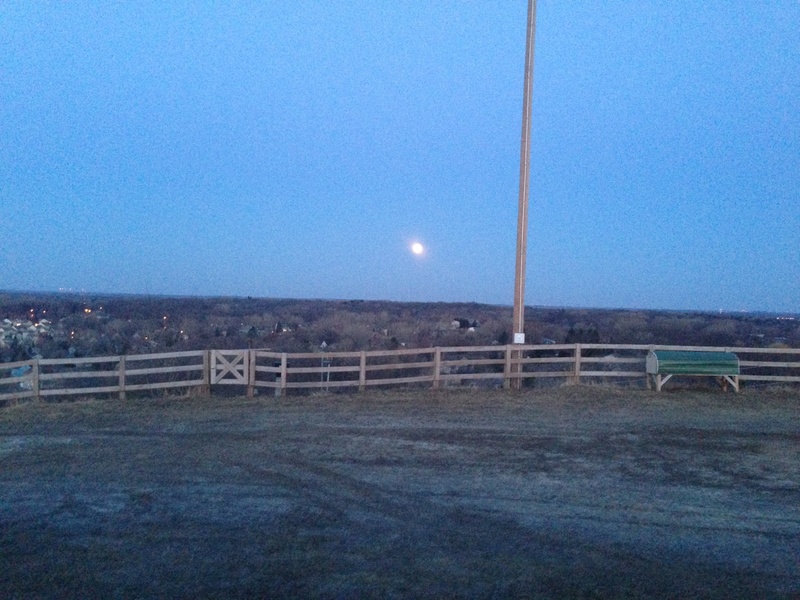 An unexpected sight – The moon, nearly round, approaching the western horizon. In its cycle, it lags behind the solar clock, rising and going to bed 1/2 hour to a full hour later each day than the day before. Today it sets at 6:05 am, yesterday it set at 5:36, tomorrow, when it is full, it will set at 6:37 – while the sun rises at 6:26. For a moment tomorrow morning, our two orbs will balance each other, poised in opposite directions, one rising in the east as the other sets in the west. I hope for clear skies!!! On this moment, it is nearly full and brilliant, gorgeously illuminating the canyon of clouds into which it is about to disappear. Driving home from a friend’s two weeks ago, I saw the moon, new and raw, a silver arc that held such promise. This moon setting in west, locking itself into a vault of clouds, this is closure. This was a special day on my journey to the solstice. Early this morning was of course the lunar eclipse, which I got up to see at its maximum and then watched as the earth’s shadow began leaving the moon, revealing a brilliantly clear orb in place of the red-shadowed wraith of a moon that had briefly loomed over the earth. 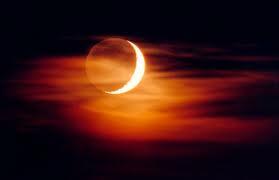 Astrologers suggest that the eclipse signaled a cleansing of emotional strife from relationships and a rebirth. So it felt to me when I saw the moon shining once more brilliantly after its death shroud had been removed. 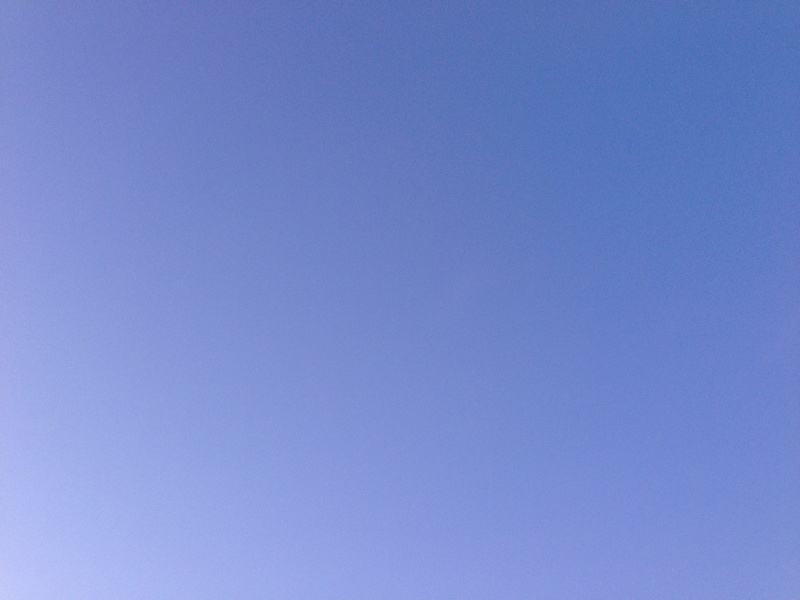 The skies were brilliantly clear. My experience was an interesting juxtaposition of being immersed in the sublime beauty of the dance between the sun and the moon and the earth, and meanwhile doing some emotional processing via text! It was not the experience I had imagined, but somehow the electronic interpersonal interface did not at all diminish the elation of my hilltop experience. The cosmic dance includes both sun and moon and man and woman, in constant cycles of drawing near and pulling away, communion and individuation. And sometimes retreating to antipodal positions, seeming so far apart that the divide could never be bridged. But this too is just one moment in the cycle. As above, so below? And were the astrologers right about the eclipse – did the shadow shroud that cloaked the moon and then her subsequent unveiling precipitate the tele-type-conversation I had, as I stood on my hilltop, and lift the palls that had been cast over our hearts, if even just a bit? As above, so below? Another overcast, cold, cold, cold, blustery day. 1 robing singing. and some braver cardinals. Some hard reminders this morning of all that I have not been. All the projects and endeavors begun, but not finished. My calling left unheeded. In too many ways, an un-lived life. In too many ways, a life un-lived. 2 inches of snow on the ground. My footsteps crunch in the frozen tire tracks that line the streets. Another morning of getting very clear on my lapses in character, and their repercussions. Doing these personal inventories aren’t exactly being present to the morning, but they are perhaps reminiscent of steps in the 12 Step Programs. So walking steps in a path, nonetheless, towards my greater goal for this journey to the solstice, to become a more ennobled version of myself. In addition to all of my other intentions described earlier, it has occurred to me that rising and taking my walk each day before the sun rises above the horizon has another provocative dimension to it. That being that I am bringing my presence to the same moment of each day, but not the same time. Despite variations in cloud cover, I am abiding in the same light each day, dwelling in one phase of the continuum of phenomena that make up the entire day. I am subsisting in a period of stasis within a dynamic system of astronomical proportions. Each day on its journey to the solstice the sun rises earlier, and thus I rise earlier to walk in the light of the dawn. Each day, I revel in the moment of dawn, and the moment that the sun actually rises, but the time on the clock is of course changing. And the season is changing; with it the plants and animals around me are changing. The inclination of the earth’s northern hemisphere toward the sun is changing. And the earth’s position relative to the sun is changing as it makes its journey around it, which is of course what is at root of all the other changes that I experience around me. Beyond that, the earth’s relationship to the moon and to the other planets in the solar system is changing; and the relationship of the solar system to the galaxy is changing as it rotates within the galaxy, and solar system’s position in the galaxy is changing as the galaxy itself rotates around the massive black hole located at its center. And the galaxy’s position in the universe, and its relationship to the other galaxies, is changing as the universe expands ever outwards. By doing my moving mediation at the same moment of each day, I am inhabiting a still point amidst cosmic change. Light, of course, displays properties of both a particle and a wave; it can be measured as either, though not simultaneously. But by immersing myself into the same moment of light each morning, I now visualize myself as a particle of light, surfing upon the crest of a light wave, being carried forward to some unknown and distant shore. 45 degrees, stilly blustery. First day in 4 days that it wasn’t 28 degrees. The robins cannot compete with the wind. The cardinals, less melodic, more strident, continue to call. Each rising sun is a miracle unto itself. Visiting my sister’s cabin in northern Wisconsin. Pulled a calf muscle yesterday during a footrace against the nephews. My intuition kept telling me this would happen, but I ran the race nonetheless. This morning, I could only shuffle about in the mist, listening to a completely different choir of birds. Beautiful, though handicapped. How much pain, how many handicaps, could one avoid, if one listened to one’s intuition? 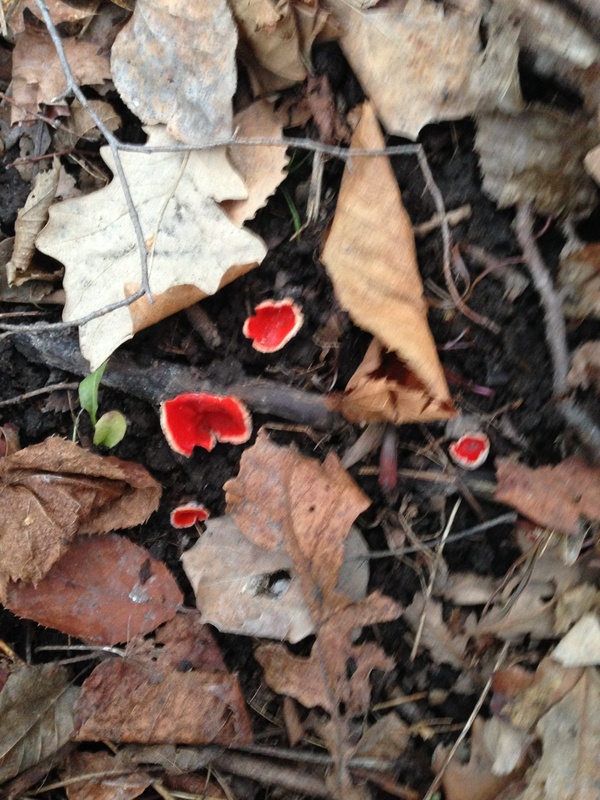 However, my injury slowed me down, way down, to a meditative pace walking in the woods this afternoon. A medicine walk, that provided insight. As has been said before, one’s wounds are a window to Spirit. My leg is better, but still quite stiff. But I go for a longer walk, not wanting to miss out on morning here in the north woods. Barred owls calling, and calling with their eerie voices. Sandhill cranes bugling off in the distance. Song birds. The palpable drumming for grouse. 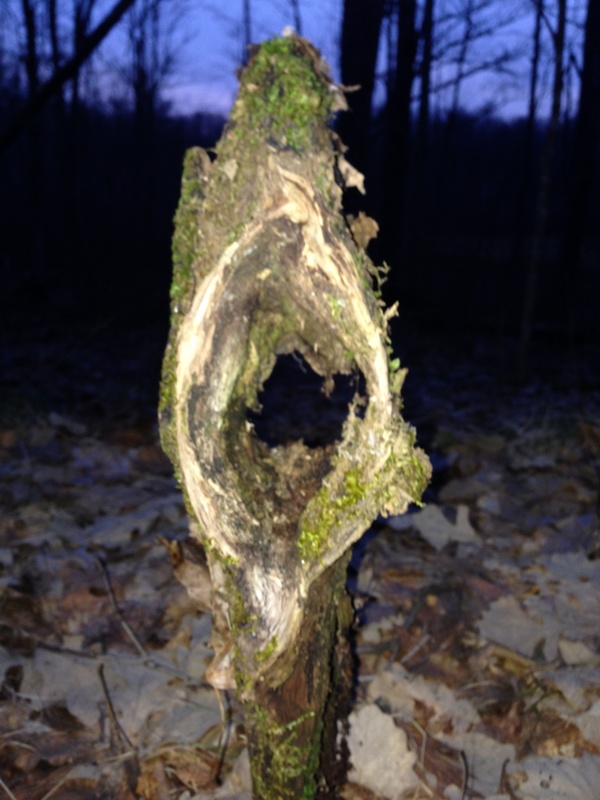 Two dueling Pileated Woodpeckers drumming upon trees, proclaiming their territories. They strike so hard, it sounds like to carpenters hammering nails. Back in Minneapolis. My leg is still stiff, but if I walk slowly, I am fine. As I approach Lake Harriet, with it’s many people walking and running around its shores, I become self-conscious of my slow, processional pace. It feels presumptuous to walk with such dignity amidst all the quick striding people that pass and approach me. But if i force it, and walk faster, I know I will aggravate my injury. So the injury gives me permission to walk at a slow pace, a pace I used to assume when stalking through the woods. In this regard, my injury is a blessing, helping me to slow down and be present. The lake is completely clear of ice. 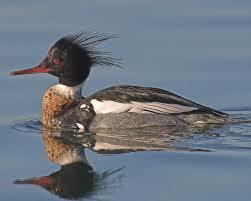 Small flocks of Common Mergansers take turn diving and surfacing. A few Loons are resting placidly on the placid water, here and there, exchanging calls. First a tremolo, then a wail, then a yodel. Primitive calls for primitive birds. Common Terns swoop and skim the surface of the water, all the while calling to each other in their harsh voices. A Song Sparrow sings. A few Canada Geese. Mallards. Today is Earth Day. Not a political or cultural holiday, as are most that punctuate our calendar, but a day set aside to honor the Earth itself, and to celebrate our connection to it. Much of my Sunrise Sadhana is about resurrecting my spiritual connection to the Earth. 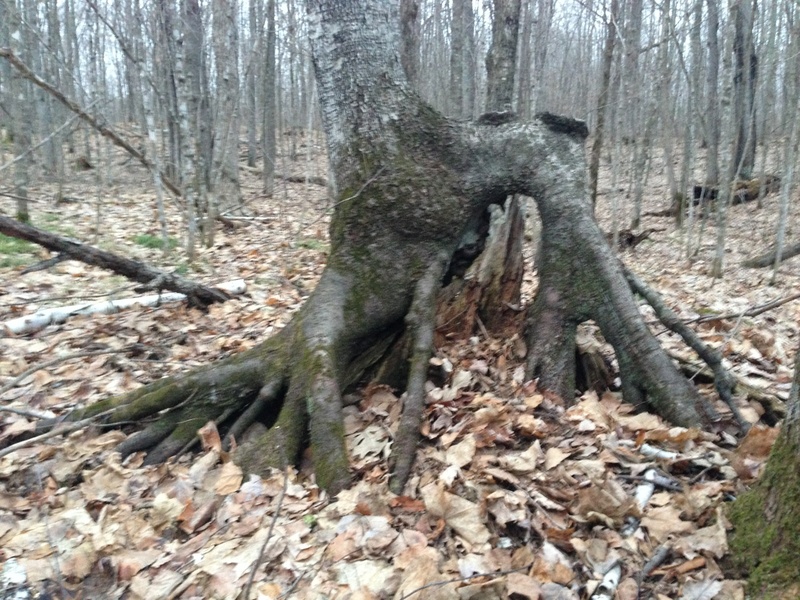 Trials and tribulations strained my connection and led me away from my path for too long, but my internal guidance has been prodding me to re-immerse myself into the Earth’s mysteries. My Zenith Arc journey to the solstice is in large measure about returning to the heights I had once reached and returning to the depths I had once known, by ascending and descending, I endeavor to reanimate the person I once was. The rock pictured above came to me during that past life, while on a vision quest. The short story is this…. While preparing to go on the vision quest, I was drifting upon a lake in a canoe, meditating with eyes closed. When I opened them, the sun in the western sky was refracted through streaks of clouds, so that it appeared as though there were 3 suns stacked on top of each other. And the phrase, “Surrender, Trust, and Gratitude” leaped to mind; I had heard this phrase some weeks before, presented as a process of actively practicing faith. The 3 steps in the process I now saw embodied in the 3 suns that shone upon me. I felt that I was to carry this message with me on my vision quest. Days after my experience with the 3 suns, I drove to the upper peninsula of Michigan, backpacked out into the wilderness, found a suitable hill top to do my quest, and began to settle in. On this hilltop there was a shallow depression that I thought would make a good spot to build my medicine wheel, in which I would spend my time fasting. While clearing the debris out of the depression, I came upon a sizable rock. It was largely buried, but with some effort I managed to dislodge it. Pulling it as though from the womb of the Earth, I discovered that upon the face of the rock were 3 red circles, that immediately brought to mind the message of the I had received of the 3 suns. 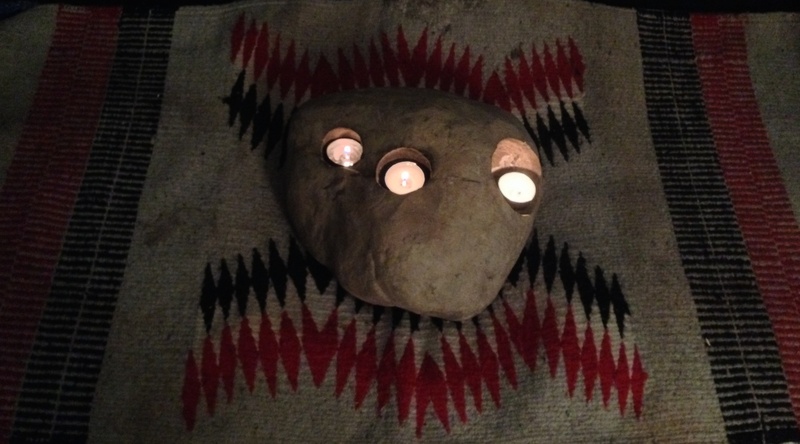 I was stunned – my steps had been so orchestrated by Spirit that I could drive hundreds of miles away from home, to place I had never been, to a spot I had no idea I was going to, and from the middle of my medicine wheel, unearth a stone that embodied the very phrase i had been given to meditate on days before. Upon closer inspection I saw that the circles on the face of the rock were actually reddish earth, compacted into holes in the stone. 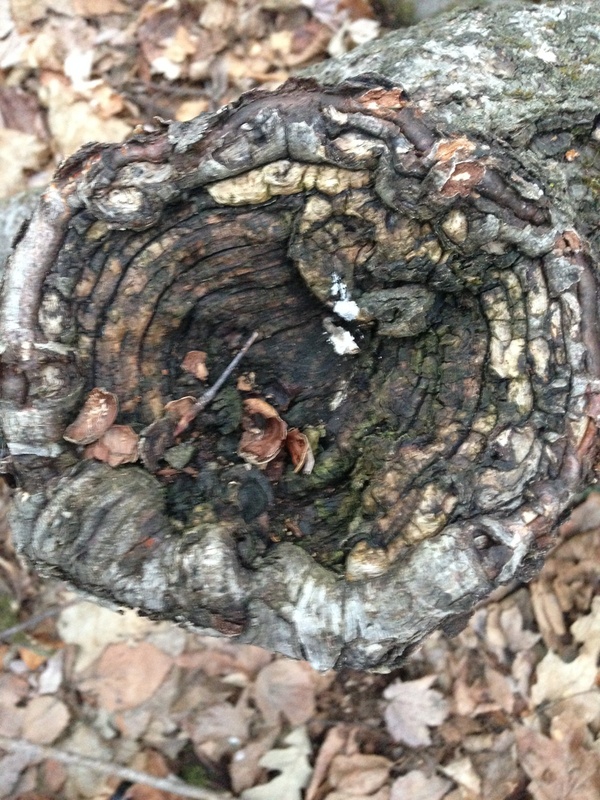 Using twigs, I scraped out the earth to reveal the holes. My guess is that millions of years ago this rock must have been part of a stream bed and that the holes are miniature “pot holes” bored out by the grit carried in whirlpools of water, and that glaciers deposited the rock on the hilltop, along with the hill itself. The stone pictured above is of course that stone. It’s about the size of a deflated basketball. It was no small task carrying it for miles out of the woods after a couple days of fasting. 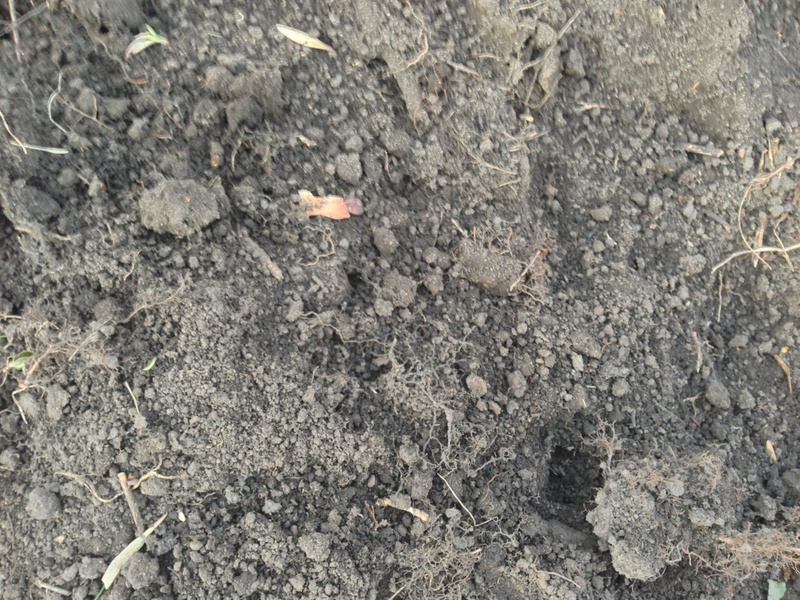 Other than scraping out the dirt, I have not altered the holes in any way. They are just as I found them. I place the candles in the holes to of course represent the 3 suns and the 3 steps of faith. Reciting these phrases, or some variation of them, can at times completely transform my emotional state from one of anguish or despair, to one of love or serenity . I surrender my situation with ____________, to the Great Holy Mystery. I trust that the Mystery will guides my steps, and bring about the highest good for everyone concerned. I am grateful for the love and support and the guidance of the Mystery. I surrender my grief to Mother Earth. I trust that She can transmute my grief into food for my growth. I am grateful for the nurturing and the love and the transformative power of the Mother. The colors this morning, in the small band of eastern sky that is unclouded, are gorgeous – amber so intense it is almost orange, is painted in broad brush strokes, above it, streaks of fuchsia and lavender. And indeed, there is rain forecast for today. 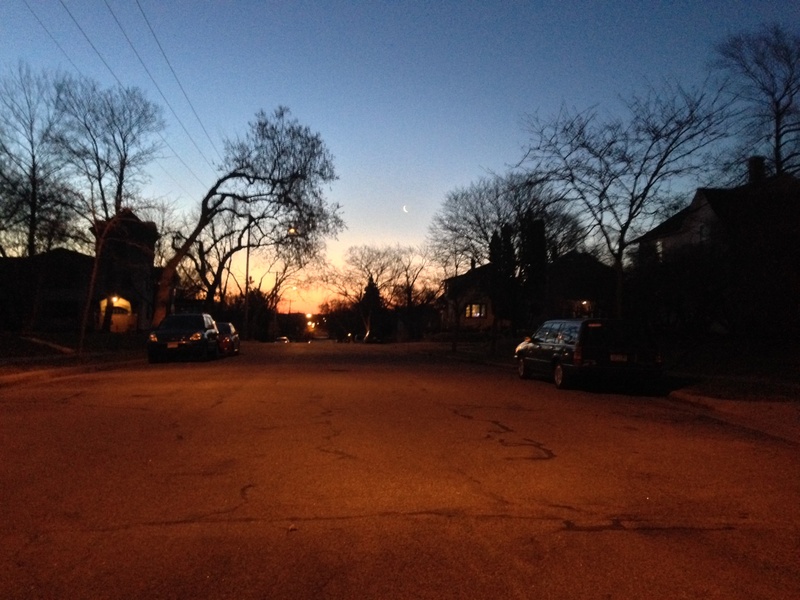 I walk along my hilltop street and simply admire the dawn through the gaps in the houses and cross streets. Looking downhill, I look down to the dawn and down into the treetops. 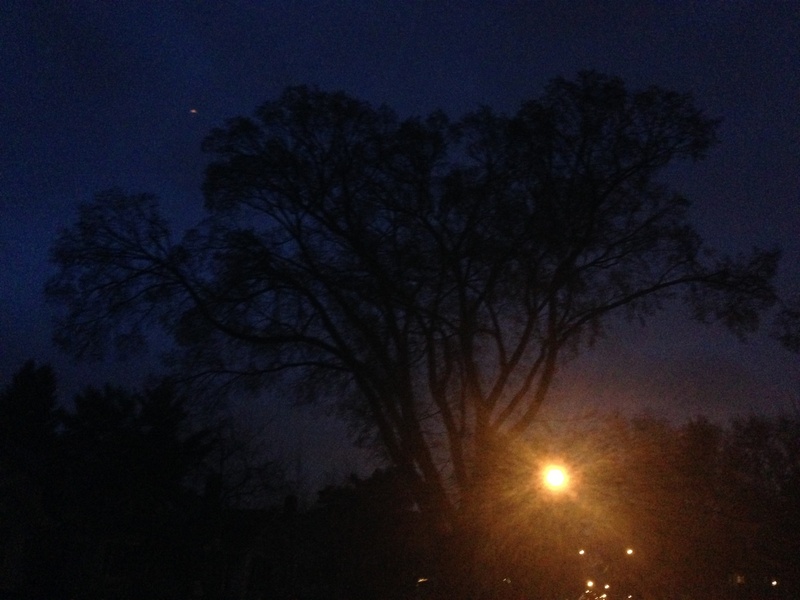 Their enormous, rounded crowns of un-leaved twigs form a filigree that overlays the dawn colors. In a few weeks this intricate tracery of twigs will flesh out into leaves, and block the dawn from view. Another walk under gentle raindrops. Though this time I am more sleepy than the rain. After days of poor wooing weather, we have a beautiful, clear & calm morning, perfect for serenading, and the Robins and Cardinals and Chickadees and Song Sparrows are out in force, singing with every once of libido in their bodies. The Terns and Herring Gulls were raising a ruckus, as usual, but I’m uncertain if that was courtship. A very fine mist that hung over the lake this morning cast pastel hues over everything. It was all very serene. While watching the grebes, an older couple approached me, asking what the birds were. As always, I was pleased to share (show off?) my knowledge about the natural world. We talked for a bit, discussed how much more waterfowl there is on the lake this year than is typical. 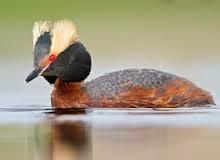 They live in the area and have walked the lake for years, and had never seen Horned Grebes before. We agreed that there were more Loons and ducks than ever. In a few days, however, the Loons and Grebes and Terns and Mergansers will all be gone, continuing their migration to more northern nesting grounds. 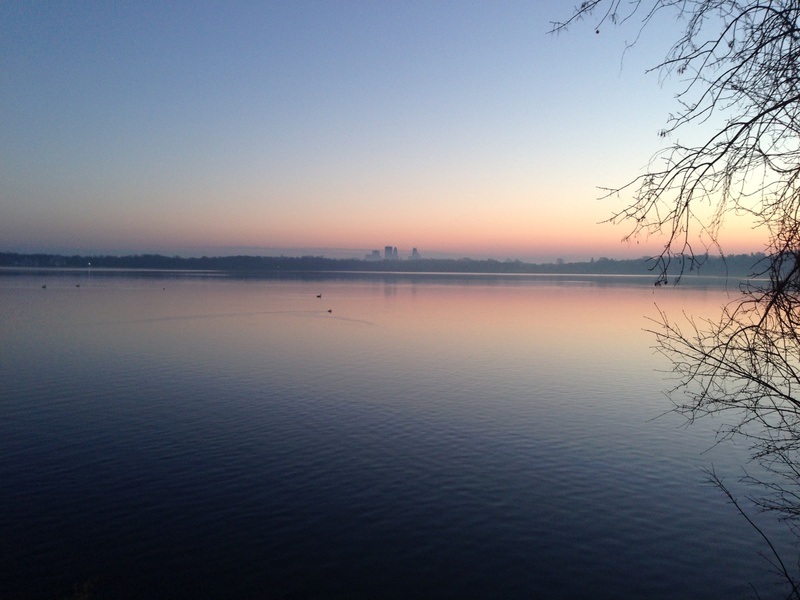 In all, my experience this morning felt more like that of a remote wilderness lake, than our humble, but hallowed, Lake Harriet located in the middle of the metro area. Each month we speak of “the new moon”, that first silver sliver of an arc that appears in the western sky after the sun has set. The moon’s arc always faces the sun, then pointing toward the departed sun. This is always the day following “the dark of the moon”. Never do we speak of “the old moon”, that last silver sliver of an arc that appears in the eastern sky before the sun has risen. The moon’s arc always faces the sun, now pointing toward the approaching sun. This is always the day preceding “the dark of the moon”. 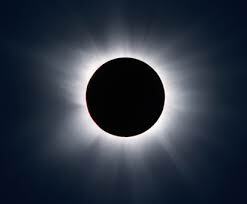 During the dark of the moon each month, the moon rides with the sun through the daylight sky, invisible to us, unless their alignment is so perfect that it creates an eclipse. begins to show her face. across the vacuum of space. My third morning walk in the rain. This one, a more steady rainfall. Divinations: Resting, gestation, internal growth, expectation, time for oneself. The rune Inguz concerns fertility and new beginnings in general. 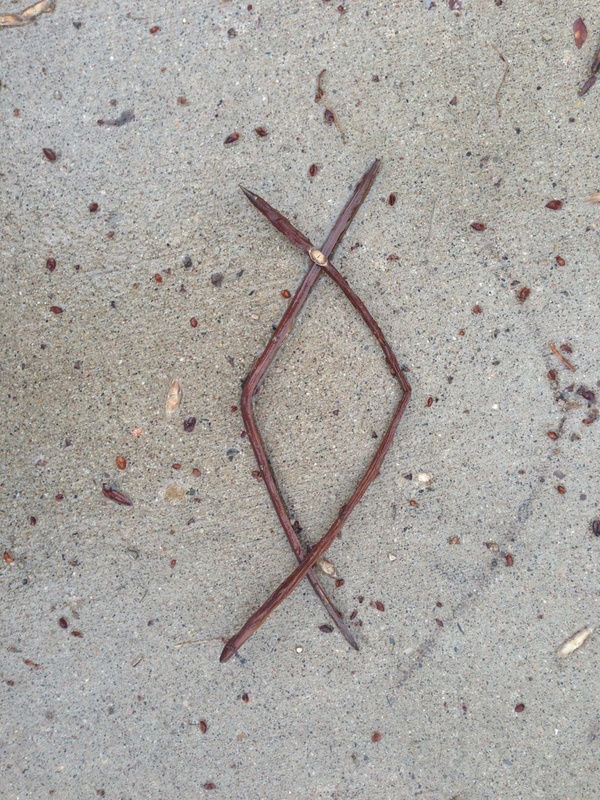 It is also a rune of transitions and may call for us to leave the past and matters of previous situations behind us. This powerful rune implies mental and emotional strength – the strength needed to achieve completion of a task, phase, or situation – and to move into a new cycle. Inguz can signify many types of cycles as it represents the intuitive faculties (long associated with the moon). Lunar cycles are also associated with tides and with cycles of fertility, nature, and births and new beginnings in general. This is one rune that is not always drawn in the same way. Rune casters and artists have their own preferences, for some the solid shape of the simple square represents strength while for others the slightly more elabourate shape serves as a reminder of the helix (cycles again !) of the structure of DNA – linking back into fertility and new birth/beginnings. More about the name of the rune Inguz: The rune Inguz is associated with the god “Ing” who was an ancient Danish Hero. 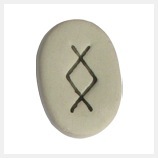 Inguz is a positive, if sometimes challenging, rune – it always has the same positive meaning. 2ND AMENDMENT TO THE BLOG ~ actually, there are SIX! 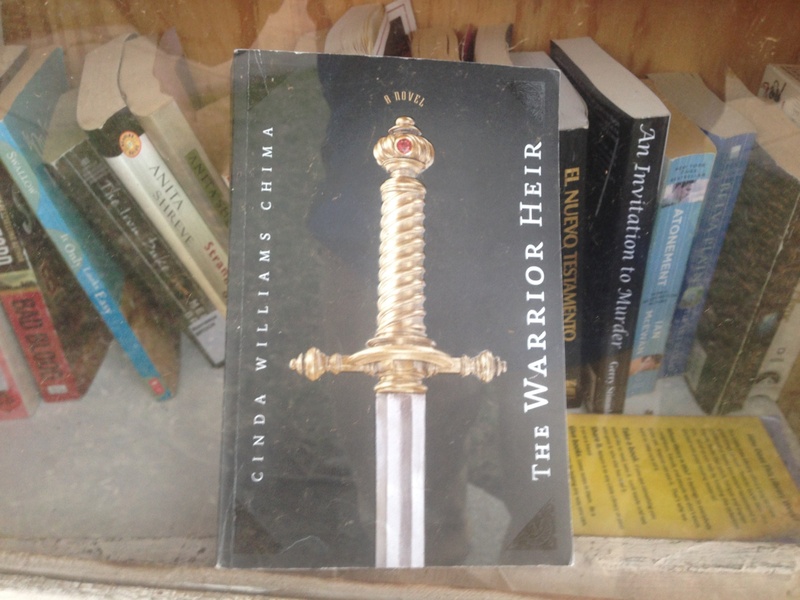 From the 6th, by the Washburn Water Tower, I get The Warrior Heir. See my entry below. Another rainy morning ~ admiring the great variety of inspired landscaping that people have done with their homes. I first discovered this water tower in Minneapolis about 2 years ago. While on my walk this morning I realized that I must now live not too far away from it. Heading in its direction I found that I live about 10 or 11 blocks away. 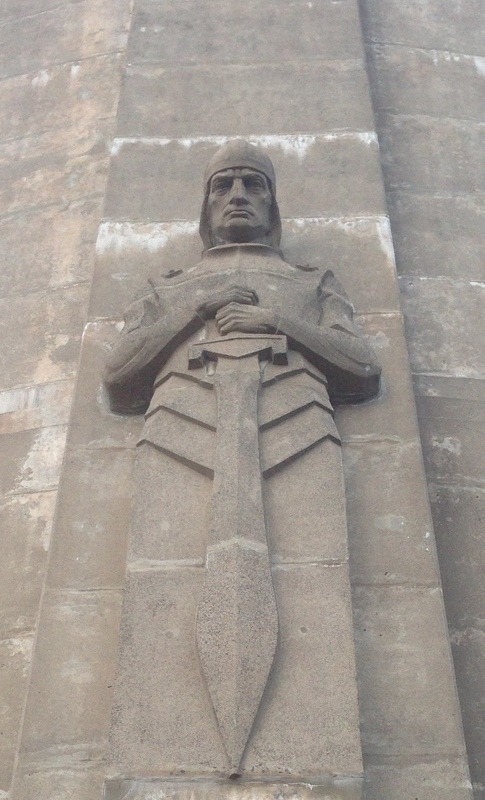 The tower has 8 knights around it – I believe in the 8 cardinal points of the compass, but I need to verify that – and 8 eagles, one above each of the knights. This is a rather uncanny followup to my post yesterday, with the Invocation to the 8 Directions & the 8 Cycles. And it also connects to my Inguz post from the day before. close-up of one of the eagles. So it’s a young adult book, but this should be fun. It seems there are two more books in the series. The Washburn Water Tower was designed by Henry Wild Jones in 1932. The story goes that as Jones was clearing underbrush at his home nearby, which was also in its construction phase, a giant eagle (with nearly an 8-foot (2.4 m) wingspan) had attacked him. He had the eagle maimed, captured, and brought to town where it began attracting much attention. 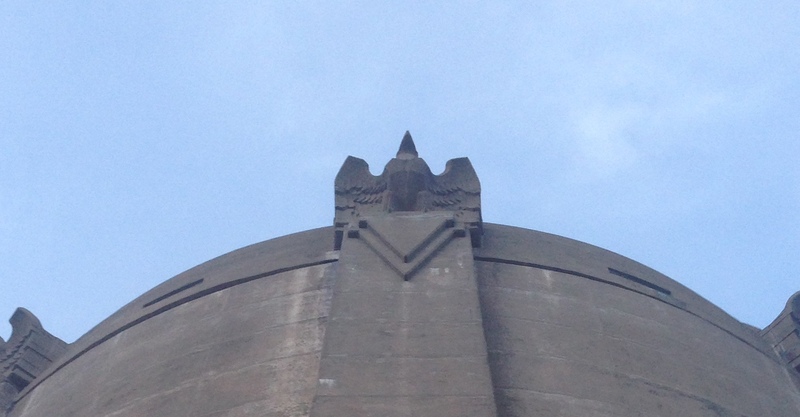 In part, he used the eagle’s extraordinary dimensions (and the artistic skills of John Karl Daniels) to cast eight concrete look-alikes, that now sit atop the tower to watch over their former domain. 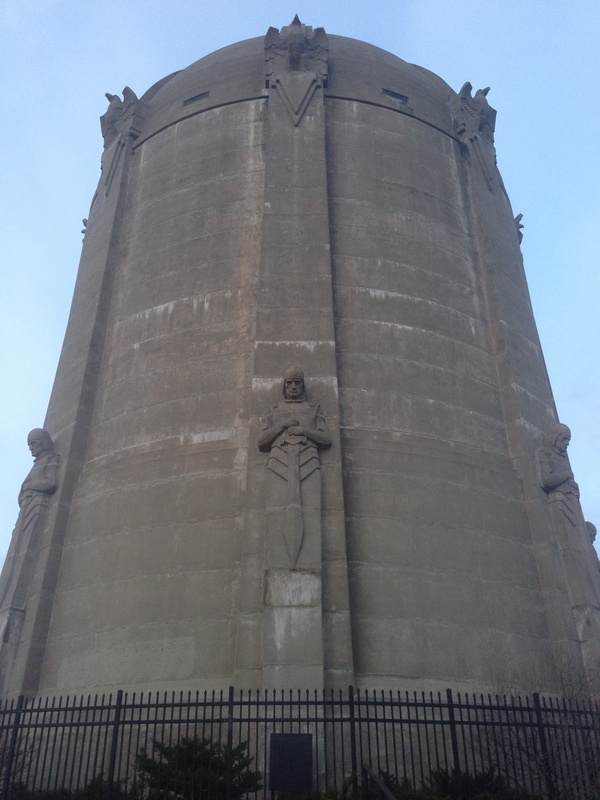 In addition, eight 18-foot-tall (5.5 m) “Guardians of Health” were placed around the tower (one under each eagle), to prevent any bad-tasting or bad-smelling water pollutants from contaminating the water supply, which were believed to be the cause of many typhoid fever outbreaks around that time. The Washburn Tower suggests a strong medieval feeling; its cylindrical dome is like a Roman warrior’s helmet. Eight hooded knights surround the tower in perpetual vigilance while, overhead, eight eagles stand, as if pausing in flight, atop the evenly spaced pilasters. The 110-foot structure holds 1.35 million gallons of water and still performs its original function in the summer months. The water tower remains an excellent example of the use of artistic design features in a public works facility. Toning postures & Qi Gong on the hilltop near Lake Harriet. Loons still calling from the lake. Catbird calling from the treetops is my companion this morning. White throated sparrows still calling. 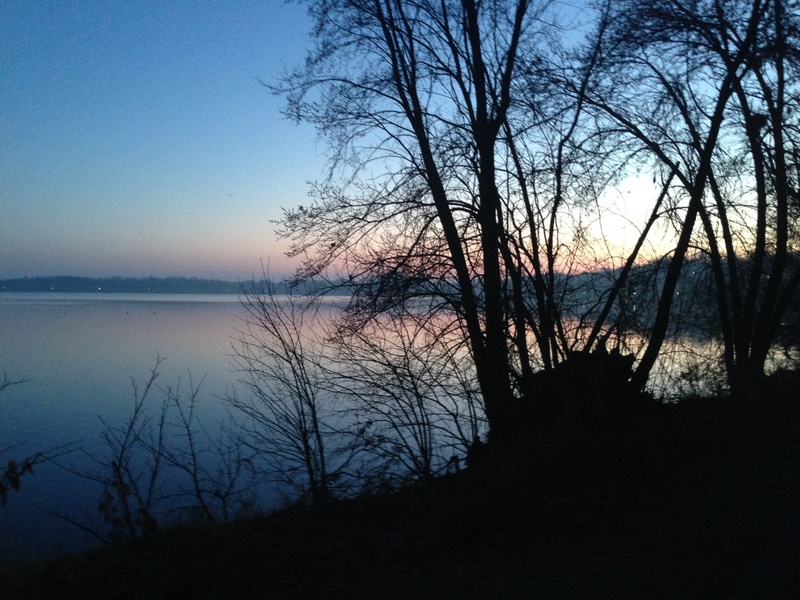 After sunrise I walk toward the lake. A Red Fox darts out in front of me, gambles across the open lawn, pauses there, then continues running off. … was charged with the first trial of his Quest, to slay his first shadow. Indignant that evil would dare to defile this sacred ground, long strides he took in pursuit of his prey. 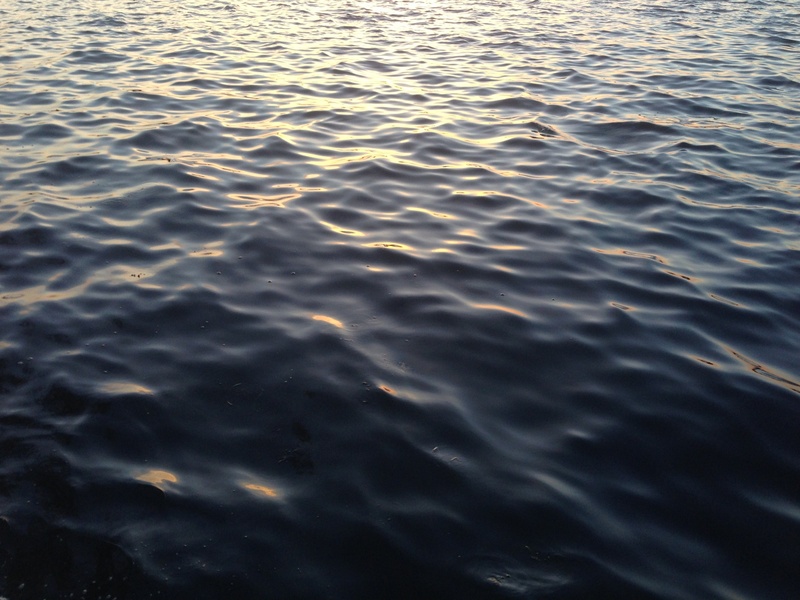 Suddenly, on an impulse that came from a source unknown, he slowed his pace to the rhythm of the lapping waters. As his footsteps kept time with the waves, and his breath merged with the breeze, it was as though a veil lifted ~ and revealed to him was the Pool of the Reflecting Heart. 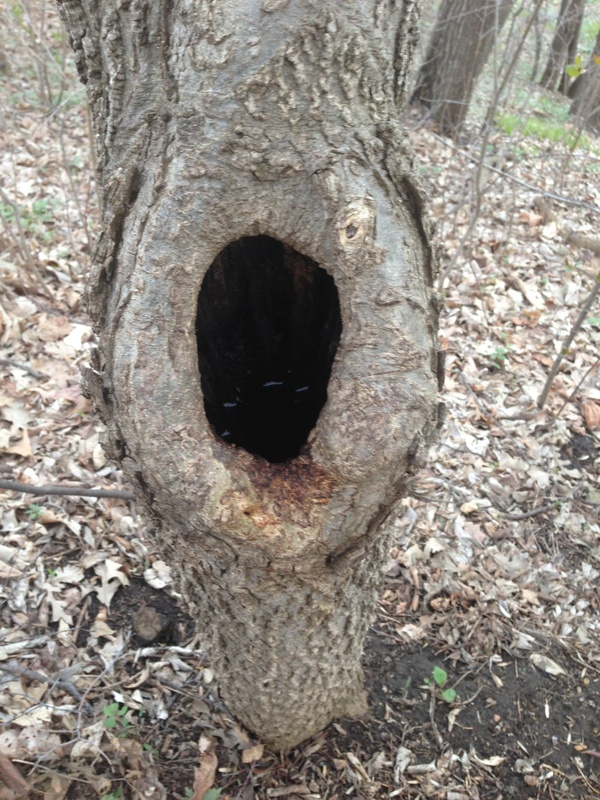 Though he had trod this path many a time, never before had he seen this portal of magical powers, hidden in plain sight. Thinking to bless his sword in the holy waters, he bent near, but when he saw his own reflection, he knew that it was not his sword, but he that must be baptized ~ that his heart must be reconciled to that of the earth, and through the earth, the entire creation, and through the creation, the Creator. 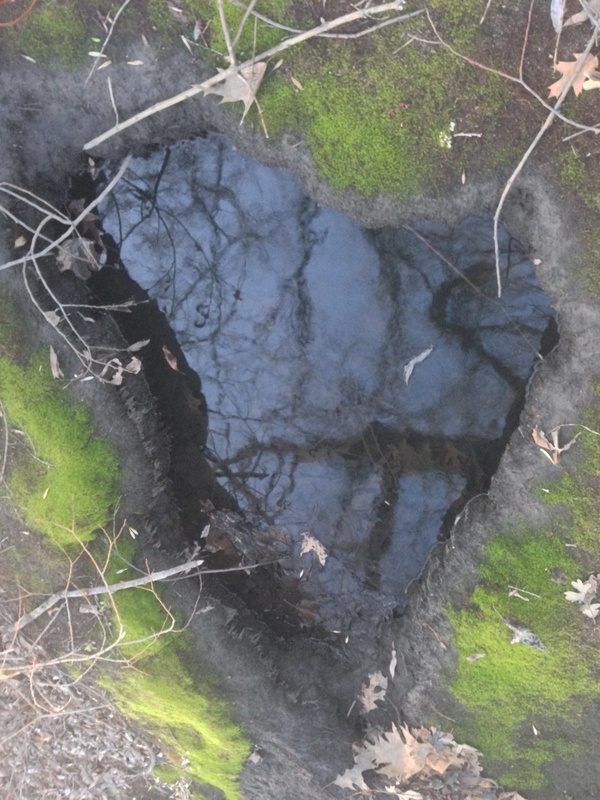 Beholding his reflection, held within the heart of the earth, held within the heart of creation, held within the heart of the Creator, he felt the heart of the Creator swell within his chest. A searing light infused the knight’s heart, purged its vile chambers, and vanquished the dark foe that lurked therein. And so it was that his first shadow was slain, the first trial of his Quest complete. Re-injured my calf muscle while hiking yesterday. Today my “walk” consisted of being outside in the overcast dawn for just a bit. Still limping. Realize that I can drive to the far side of the lake and watch the sunrise. Beautiful morning. A fairly unremarkable day. Still nursing the pulled muscle in my calf. Just did a short walk under overcast skies but mild temps. On my walk this morning, for the first time I have wondered through the alleys; since I’m still limping, it seemed an accessible but new adventure. I soon found myself musing upon the difference between people’s front yards and their back yards. Their front yard is their public face. An expression of their aesthetic sensibilities – how they wish to beautify their neighborhood, how they wish to welcome their friends and family that come to their door. Their back yard, on the other hand, is a glimpse into the activities of their lives. Are they vegetable gardeners? Sports enthusiasts? Do they grill? Do they sit by a fire? Have they created an elaborate space to entertain guests? Have they wrapped beautiful landscaping around cozy places to sit? Is their backyard a blank slate, with nothing but grass? Of course, their private life takes place within the walls of their home. Their interior life remains a mystery. The front yard and back yard, though they tell us something about the inhabitants of a home, these are just glimpses into their lives. Only by being invited into their homes to we get a feel for the real tenor and quality of the life that is lived there. Do the homes with the most beautiful landscaping house the most beautifully led lives ~ or the opposite? Do the homes with no, or neglected, landscaping house sterile lives ~ or perhaps they house lives so richly immersed in other concerns that exterior is forgotten? The same is true with people themselves. We can see the persona that they project to the outer world. We observe their activities. And from these we can learn a lot about a person. But unless we are invited into their personal thoughts, we can only guess at their interior world. We are all products of, and participants in, our culture. Our cities and neighborhoods have a particular complexion. Our lives have great commonalities. And yet, each life is undeniably unique. Into how many of these unique interiors have we had the privilege of being invited? What was the tenor of my walk this day, which is now yesterday? I neglected to write it. It was overcast, chilly. I walked the neighborhood. I was there. Drove to Lake Harriet and walked through the wetland. A glorious morning. Clear skies, brisk temperatures, freshening breeze, birds singing so beautifully. Robins in the parklands, Redwings in the wetlands. White Throated Sparrows, still. And others. Loons still on the lake. As are coots. Woodducks in the wetland. A Northern Shoveler. Also on Lake Harriet, Least Grebes, which I got to witness submerging. During my walk this morning I was thinking of the opening lines to a novel that I’m working on, wondering if they would draw the reader into the story as they must, to entice the reader to continue reading. Then I began browsing through my memory of opening lines to books that I could recall off the top of my head. Of the several I remembered, my mind lingered upon the opening line from Tolkien’s “The Hobbit”. In this one formation, three scenes of the Hobbit are brought into one, a bird heralding the sun’s illumination of a hidden passageway that leads into a dragon’s lair, a hole in the ground where something dwells, and the waking of the dragon. 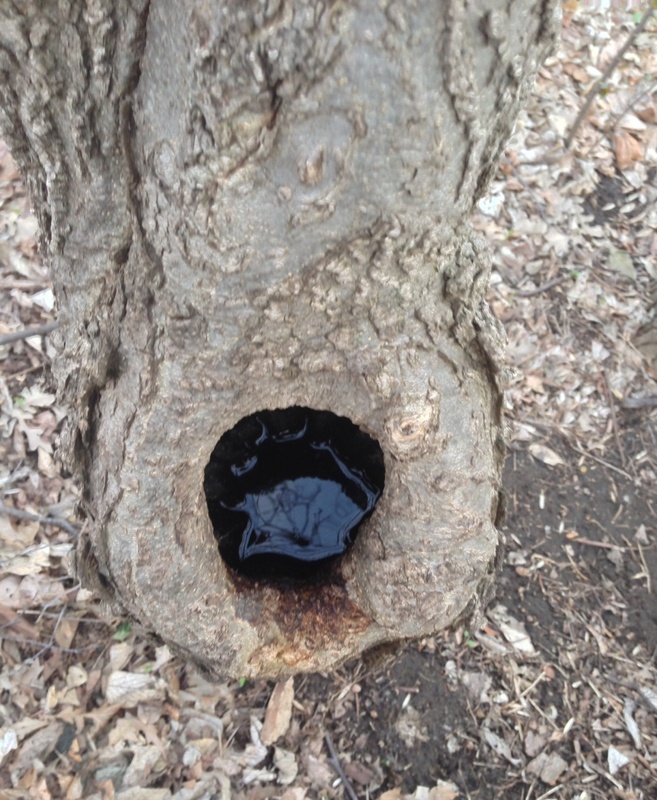 Perhaps one need not wonder where this portal leads…. And, given the opposite nature of my experience to the “prophecy” that aids Bilbo, this suggests that it is not a hostile, but a helpful dragon that awaits on the other side of this gateway. 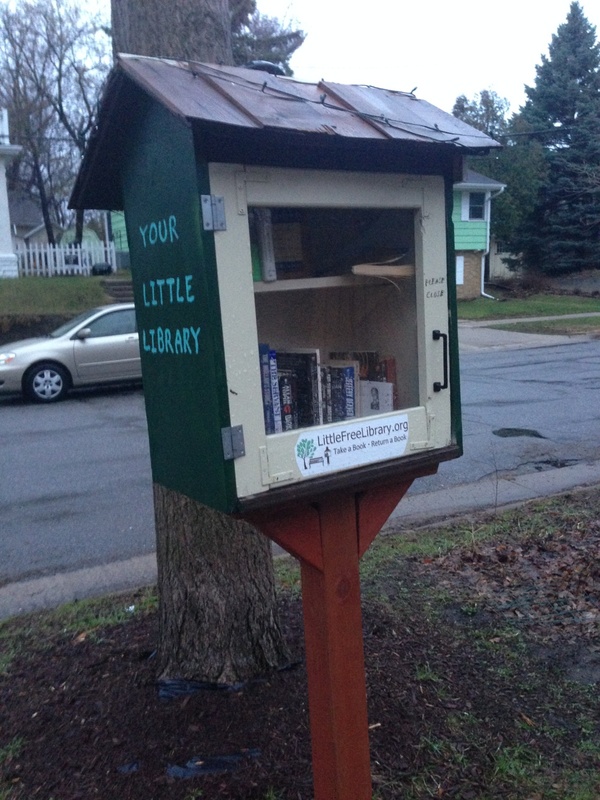 have now discovered TEN Little Libraries in my neighborhood, all of them within 10 or 11 blocks of my home. I am charmed and amazed. Here they all are, in reverse order of my encountering them. At the conclusion of my walk this morning I stopped at my local coffee shop. There, a young woman soon sat down in the couch across from me and began to meditate. We had never met, but she occasionally opened her eyes at smiled at me. When she concluded her meditation she told me that she had been led to this coffee house, which she had never before visited, specifically to meet me. She gave me the phone number of her “spiritual co-creator” and suggested that I give her a call and invite myself over for dinner. Which I did. Had a lovely dinner with 3 complete strangers – the “co-creator”, another woman, and a man. We talked of many things. Enjoyed a meal of vegetarian tacos. Shared some stories and information. Sang some songs. I am uncertain what will come of this strange and surreptitious meeting. Through some synchronicities in our blog posts about dragons, I have exchanged some messages with Jo Robinson (www.africolonialstories.wordpress.com) and also involving the books in the 11th Little Library that I encountered, I have learned the Jo has written a novel that involves dragons and have ordered it through Barnes and Noble. Full moon. Returned to my secret hilltop to watch the sun rise and the moon set. This time with a companion. For three days and three nights he readied himself to journey though the gateway. When finally prepared, he let go his physical being and his disembodied soul entered the portal, and traveled through the winding passages of wyrm holes. Soon he found himself, not in a den of a solitary dragon, but within a dragons’ lair holding dozens of the creatures. Uncertain of his purpose, he carefully snaked his way through the throngs of snarling beasts. There, a young dragonling befriended him..
With its aid, other dragons the knight met, and then was flown to the heavens, for an audience with, Draco, Lord of the Dragons..
And there what transpired cannot be told in the tongues of men. “A thought for your penny” ~ I use the saying this way: each time I find a penny lying on the ground, I look at the year the penny was minted and recall how old I was that year, where I was living, and what was important to me at the time. Applying it this way, it calls to mind a time or an event in one’s life that one wouldn’t otherwise have had the occasion to recollect. Some times nothing of note stands out, but most times it’s like getting a free bit of nostalgia ~ a cherished memory or significant event or life lesson comes forward to be relived. In any case, it’s always a fun game to play and makes bending down to pick up the penny worth the effort! So without explaining why, I changed the subject and asked her where she was in 1979 and what was important to her then. She shared a few things and, building upon that, within a few moments I had sketched out a theme and an outline for a workshop that she was thrilled with and that was in alignment with her own current process. I then explained my “thought for your penny” concept, why I asked about 1979, and how that led to the workshop idea. We both thought the chain of events was pretty cool. I invite you to try this quaint little exercise and see what memories your pennies bring you. I had some wonderful encounters with Great Blue Herons on my walk this morning. The Great Blue Heron is a master of patience and stealth. It will stand motionless for long periods, waiting for a fish to swim by. When one does, the heron strikes with lightning swiftness to spear its food. And if ever one were looking for a model for doing a walking meditation, the heron is it. Its movements are a study in mindfulness. ~ On another level: the Heron does not plunge into the water, but stares into it from above. One could immerse themselves into the their emotions to experience them or, using the Heron as a symbol, one could take a removed stance and study them with the mind, searching for what actually feeds and sustains one in the moment. Regrettably, this video from the morning is not clear enough to show the mindful purpose with which the heron articulates its legs as it walks, but one can still get a sense of how it moves. Saw this movie, Finding Joe, last night. Highly recommend it. So excellent. Pretty big synchronicity as well, for recently I have been thinking very seriously about reading “The Hero With a Thousand Faces” . This meshes so well with my own current journey, and my playful – yet autobiographical – series of blog posts: Quest of the Knight Errant. …to make his sojourn within the neighborhood that has been officially dubbed Kingfield, a regal area that lies within the larger boundaries of the Municipality of Lakes. That the region was so named he came to learn through his converse with those who administer the realm. 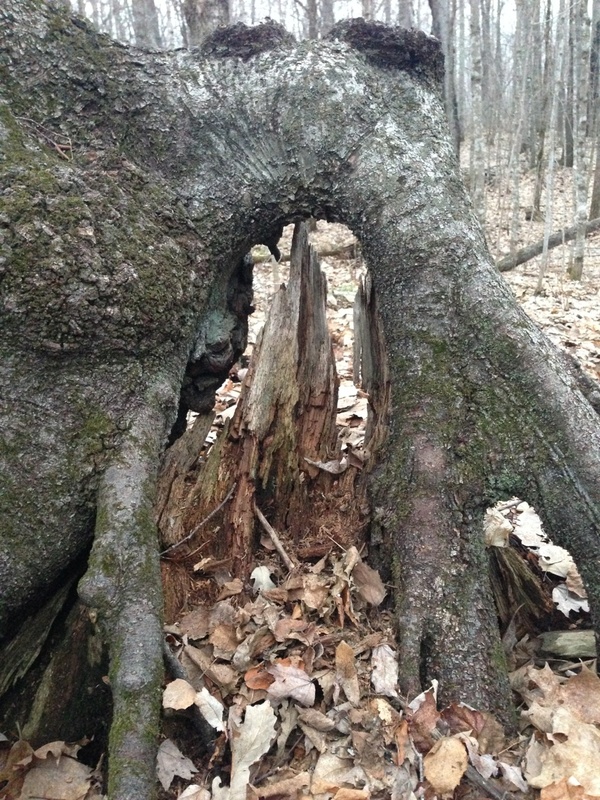 Perhaps there are other knights who dwell within these abodes? Assuredly, everyone has their own vision of what the Holy Grail is and what it represents. Nevertheless, I’m going to present my concept of it, even though you’ve already got one. Actually, my experience of the Grail comes from a dream I had several years ago. I had picked up a copy of Marion Zimmer Bradley’s The Mists of Avalon and, so enthralled was I by her retelling of the legend, that I put aside all else and read the voluminous epic cover to cover in a couple of days. When I had finished reading I found myself quite spontaneously asking the Great Mother for a dream. I had never done such a thing before and was surprised by my own impulse. I was not disappointed. I am walking through a medieval forest and encounter a path that leads into a clearing in the woods. I pass by a ritual space where a bull has been sacrificed, then join a crowd of people who are watching a priestess who stands on a raised platform. 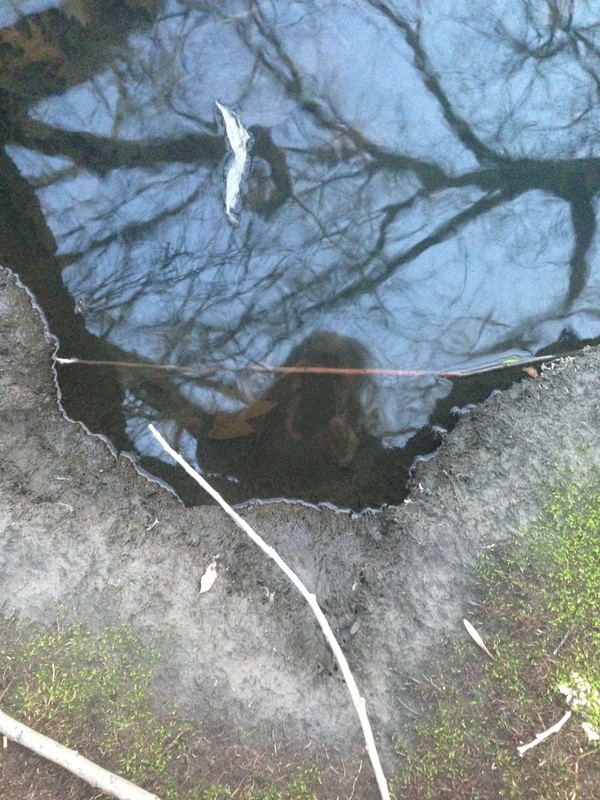 The priestess stands behind an immense glass basin that is filled with water. In her hand she holds a crystalline goblet. The priestess raises the goblet and speaks in a clear, strong voice that carries across the crowd, “A Grail cannot be destroyed…” she says, and with that she strikes the goblet against a stone with all of her might. The goblet is undamaged. “But, she continues, “a Grail can be fragmented ….”, she now inserts a silver rod into the goblet and pries against the rim. A small, jagged crystal chip cracks away from the rim. Again she raises the goblet in the air and proclaims, “A Grail cannot be filled…” plunging the goblet into the transparent basin of water as she speaks. All can see that no matter how she turns it, no water will enter the goblet. “A Grail,” she explains, “can only fill itself.” She then holds the goblet upside down and begins rotating it in her wrist over the top of the basin. As she does so, water begins twirling in an upward spiral out of the basin, filling the still upside down goblet. As the water fills the goblet, the goblet sings as the twirling water traces its rim. When striking the place where the goblet is chipped, rather than causing discord, the tone intensifies with harmonics. Upon awakening from the dream, its interpretation was already in my consciousness. The crystalline goblet, the Grail, is the Soul. A Soul cannot be destroyed, but it can be wounded and fragmented*. A purpose cannot be imposed a Soul, at least not one that will fulfill it. A Soul comes into this life with its own intentions and can only be fulfilled by that purpose. That purpose can be called forth and actualized even in seemingly impossible conditions. The wounds a Soul has endured are connected to its purpose and its fulfillment. In the process of actualizing its purpose, a Soul will resonate more intensely where it once was wounded. What brings this dream to mind now is of course the content of some of my recent posts. When I began my Sunrise Sadhana in early April, I had no inkling that my morning ritual would take on the character of a quest and that I would imagine myself in the guise of a knight-errant. 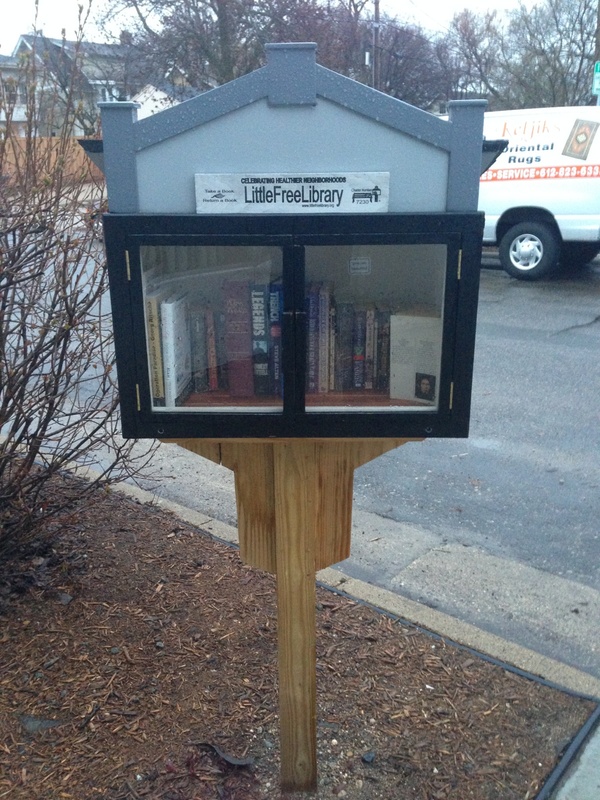 It wasn’t simply my visiting water tower with the statues of the knights that inspired me to take on this persona, but the addition of discovering near the water tower a Little Free Library that held a book with an image of a sword that resembled those held by the knights. The coinciding of these 3 components felt like far more than mere coincidence. So, while it wasn’t the equivalent of having a sword bestowed upon me by the Lady of the Lake, nor the equivalent of drawing the Sword from the Stone, perhaps, if one were to be generous, one could construe my experience as receiving a sword from the Lady of the Library? Or perhaps drawing the Sword from the Shelf? : ) In any case, it did feel quite compelling, like the experience had been orchestrated for a purpose. In the book that I was led to, the name of the sword is “Shadowslayer”, which, as I have blogged, has been wielded thus far only against my own shadow. Something that is central to the Arthurian legends ~ one must be virtuous enough to find the Grail. So I have been pondering this. The theme of the Grail romance is that the land, the country, the whole territory of concern has been laid waste. It is called a wasteland. And what is the nature of the wasteland? It is a land where everybody is living an inauthentic life, doing as other people do, doing as you’re told, with no courage for your own life. The Grail represents the fulfillment of the highest spiritual potentialities of the human consciousness. …the separation of matter and spirit, of the dynamism of life and the realm of the spirit, of natural grace and supernatural grace, has really castrated nature. And the European mind, the European life, has been, as it were, emasculated by this separation. The true spirituality, which would have come from the union of matter and spirit, has been killed. And so the impulses of nature are what give authenticity to life, not the rules coming from a supernatural authority—that’s the sense of the Grail. Obeying societal norms, the adventure fails. And then it takes years of ordeals and embarrassments and all kinds of things to get back to a revelation of the Grail and the opportunity to heal the self and heal society, through the natural opening of the human heart. That’s the Grail. * These fragments can be healed and reintegrated through therapy or through such mediums as a Shamanic Soul Retrieval. ~ Last night I loaded the Grail picture from Monty Python. 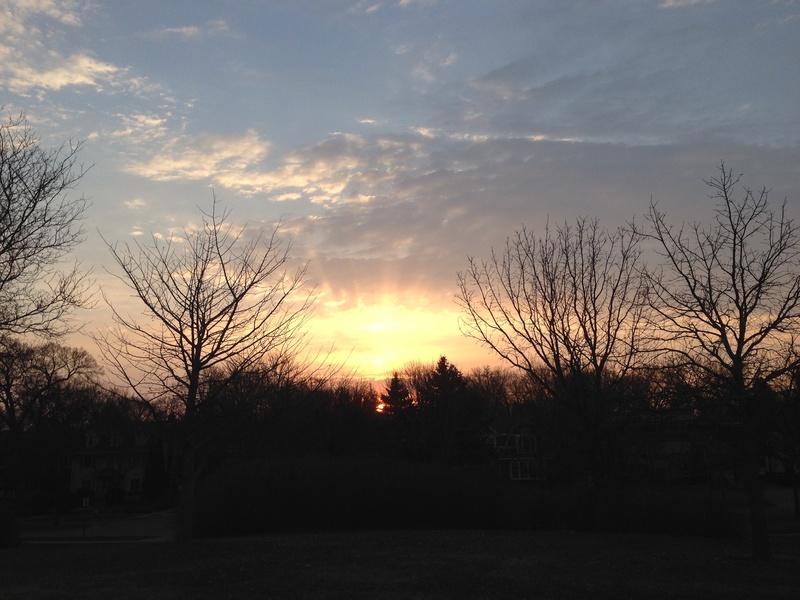 This morning I took the picture of the sunrise ~ I am struck by some similarities. CAMPBELL There’s a very interesting statement about the origin of the Grail. One early writer says that the Grail was brought from heaven by the neutral angels. You see, during the war in heaven between God and Satan, between good and evil, some angelic hosts sided with Satan and some with God. The Grail was brought down through the middle by the neutral angels. It represents that spiritual path that is between pairs of opposites, between fear and desire, between good and evil. In a wasteland the surface does not represent the actuality of what it is supposed to be representing, and people are living inauthentic lives. “I’ve never done a thing I wanted to in all my life. I’ve done as I was told.” You know? MOYERS And the Grail becomes? CAMPBELL The Grail becomes the—what can we call it?—that which is attained and realized by people who have lived their own lives. The Grail represents the fulfillment of the highest spiritual potentialities of the human consciousness. The Grail King, for example, was a lovely young man, but he had not earned the position of Grail King. He rode forth from his castle with the war cry “Amor!” Well, that’s proper for youth, but it doesn’t belong to the guardianship of the Grail. And as he’s riding forth, a Muslim, a pagan knight, comes out of the woods. They both level their lances at each other, and they drive at each other. The lance of the Grail King kills the pagan, but the pagan’s lance castrates the Grail King. What that means is that the Christian separation of matter and spirit, of the dynamism of life and the realm of the spirit, of natural grace and supernatural grace, has really castrated nature. And the European mind, the European life, has been, as it were, emasculated by this separation. The true spirituality, which would have come from the union of matter and spirit, has been killed. And then what did the pagan represent? He was a person from the suburbs of Eden. He was regarded as a nature man, and on the head of his lance was written the word “Grail.” That is to say, nature intends the Grail. Spiritual life is the bouquet, the perfume, the flowering and fulfillment of a human life, not a supernatural virtue imposed upon it. MOYERS Is this what Thomas Mann meant when he talked about mankind being the noblest work because it joins nature and spirit? MOYERS Nature and spirit are yearning for each other to meet in this experience. And the Grail that these romantic legends were searching for is the union once again of what has been divided, the peace that comes from joining. CAMPBELL The Grail becomes symbolic of an authentic life that is lived in terms of its own volition, in terms of its own impulse system, that carries itself between the pairs of opposites of good and evil, light and dark. One writer of the Grail legend starts his long epic with a short poem saying, “Every act has both good and evil results.” Every act in life yields pairs of opposites in its results. The best we can do is lean toward the light, toward the harmonious relationships that come from compassion with suffering, from understanding the other person. This is what the Grail is about. And this is what comes out in the romance. In the Grail legend young Perceval has been brought up in the country by a mother who refused the courts and wanted her son to know nothing about the court rules. Perceval’s life is lived in terms of the dynamic of his own impulse system until he becomes more mature. Then he is offered a lovely young girl in marriage by her father, who has trained him to be a knight. And Perceval says, “No, I must earn a wife, not be given a wife.” And that’s the beginning of Europe. MOYERS The beginning of Europe? CAMPBELL Yes—the individual Europe, the Grail Europe. Now, when Perceval comes to the Grail castle, he meets the Grail King, who is brought in on a litter, wounded, kept alive simply by the presence of the Grail. Perceval’s compassion moves him to ask, “What ails you, Uncle?” But he doesn’t ask the question because he has been taught by his instructor that a knight doesn’t ask unnecessary questions. So he obeys the rule, and the adventure fails. And then it takes him five years of ordeals and embarrassments and all kinds of things to get back to that castle and ask the question that heals the king and heals society. The question is an expression, not of the rules of the society, but of compassion, the natural opening of the human heart to another human being. That’s the Grail. MOYERS Eliot speaks about the still point of the turning world, where motion and stasis are together, the hub where the movement of time and the stillness of eternity are together. CAMPBELL That’s the inexhaustible center that is represented by the Grail. When life comes into being, it is neither afraid nor desiring, it is just becoming. Then it gets into being, and it begins to be afraid and desiring. When you can get rid of fear and desire and just get back to where you’re becoming, you’ve hit the spot. … The goal of your quest for knowledge of yourself is to be found at that burning point in yourself, that becoming thing in yourself, which is innocent of the goods and evils of the world as already become, and therefore desireless and fearless. That is the condition of a warrior going into battle with perfect courage. That is life in movement. That is the essence of the mysticism of war as well as of a plant growing. I think of grass—you know, every two weeks a chap comes out with a lawnmower and cuts it down. Suppose the grass were to say, “Well, for Pete’s sake, what’s the use if you keep getting cut down this way?” Instead, it keeps on growing. That’s the sense of the energy of the center. That’s the meaning of the image of the Grail, of the inexhaustible fountain, of the source. The source doesn’t care what happens once it gives into being. It’s the giving and coming into being that counts, and that’s the becoming life point in you. That’s what all these myths are concerned to tell you. …trudging through the desolation, his erring steps inexorably betraying him more and more, he was at last brought to his knees by overwhelming grief. As the winds of anguish howled through his chest, they blew upon the embers of his withering soul, kindling them within their blanket of ash. In the dark before dawn, his wakened soul urged him from his slumbers, to venture into the chill darkness. Clad against the cold, his guided footsteps led him to the hallowed lake, and there the rising sun revealed that still, after his long neglect, there was yet a path out of his frozen waste. Henceforth the knight resolved to rise each day to greet the sun and secure what succor might be found in the promise of each new dawn, and to demonstrate to what gods there may be his commitment to his re-found path. A faltering spring struggled against the grip of the relentless winter, as though the claws of cold might once more ensnare the world. But the sun prevailed and the knight, rewarded for his faithfulness to his pledge, was charged with a quest – to slay the shadows that lurked within his soul. And recalled his sullen poetry from his days of desolation.. The Water shines upon Me. of That which shines within the Sun. nor the Sun, that shines upon the Moon. nor That which shines within the Sun. to reach the Source of all that is. Though he had yet to grasp the Grail and drink from its lips, this bear glimpse of its glory ignited the flame within his chest, and once again he felt the Source that burns within the sun burn within his Soul. And the light of the sun shone upon the face of the knight. This Mural for Schell’s Beer, a brewery located in my home town, is a few blocks from my home. As lofty as my goals were, they were spoken with the modest hope that I could, to some degree, turn my internal life around. Though I journeyed with the sun to its zenith, and I have risen far, the apex of my personal trajectory is still far above my present station. That being said, the journey has been far richer, far more rewarding, far more than I could have imagined. And, most astonishingly, kindred spirits have accompanied me, reading my posts, and sharing their wonderful comments. Though my journey was solo, it was immensely gratifying to share it with a such a wonderful and varied entourage of beautiful souls. Such beautiful writing . . . So glad that you visited my blog and left a trail that led here. How I enjoyed this series of sunrises. 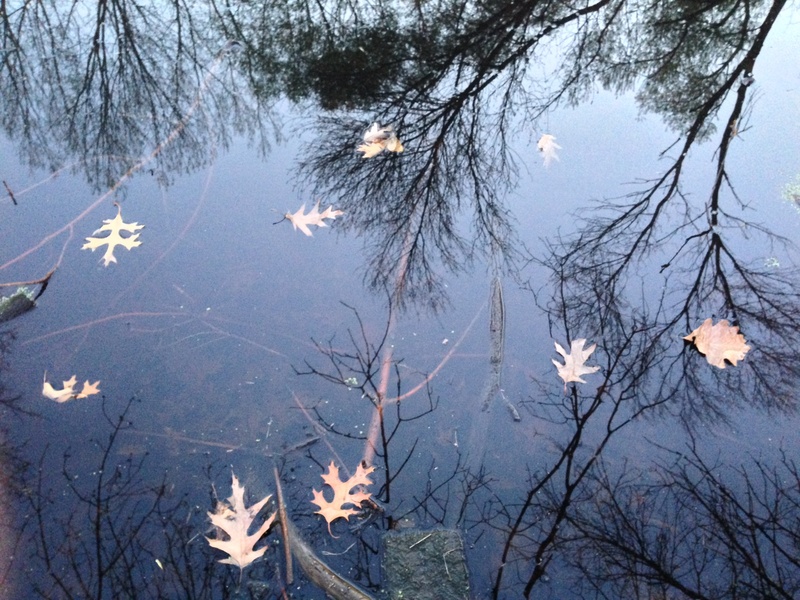 The photos so serene and evidence of communion with the earth, spiritually and mentally. many hundreds of years ago, I lived in the highest area of the NC mountains and often spent time walking or just sitting and listening and smelling the seasons changing around me. this reminds me very much of that time.and although I no longer live there, the area has never left my heart. I do not know how you found my blog but I thank you for following. It is a bit of a mishmash but I have fun and so do others. I liked your woodpecker haiku very much. I’ve been working on my haiku for years and am rarely satisfied, but I keep trying. I write classical haiku, not just a short poem of 5-7-5. So I did truly appreciate the haiku. I’ve heard that woodpecker in the woods behind our house. Sorry to be so chatty. But I have so enjoyed this visit to your blog. I look forward to getting more posts from you in the future.